During sleep, all muscles in your body relax, including those of the throat. Referred to as “otolaryngologic muscles”, your throat muscles relax and collapse upon themselves, blocking the upper airways, leading to sleep apnea. Singing exercises your vocal cords (tissues or structures in the throat that mediate speech), which are controlled by the muscles in the throat. How Does It Cure Sleep Apnea Exactly? Singing therapy cures sleep apnea by strengthening these muscles and the other soft tissues in the throat. This results in increased tone which can keep your airways open during sleep. Singing exercises also strengthen other muscles controlling your soft palate and other structures in the throat. When you use different musical tunes and frequencies of sound, the involved muscles are exercised and strengthened. Despite being a widespread fact, a lot of patients are still skeptical about the effectiveness of singing exercises for sleep apnea. However, there are specific studies that prove that singing can get rid of sleep apnea completely. One study was conducted by the University of Exeter in Exeter, United Kingdom. The duration of snoring of 20 chronic snorers was recorded by voice-activated tape recorder for 7 nights both before and after treatment. The therapeutic intervention consisted of instruction in singing technique and singing exercises which subjects were directed to practice for 20 minutes a day for 3 months. Compliance was encouraged by a further visit and regular telephone follow-ups. The results of the study showed that snoring was on the average reduced, especially in subjects who performed the exercises accurately and consistently and who were not overweight. You can read more about the study here. Who Can Benefit From Singing Therapy? Singing therpay is not for everyone. Among all the management options for sleep apnea, singing therapy is among the safest and the easiest to implement. It is neither age dependent nor gender dependent. At the same time it does not restrict you in terms of schedule and time management. 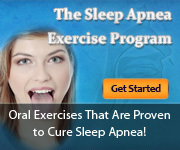 Therefore a large percentage of individuals suffering from sleep apnea can benefit from this alternative treatment. However, if you suffer from very severe forms of sleep apnea, you may not benefit from singing therapy. This is because you are at a high risk of suffocating to death during sleep due to breathing problems. Severe sleep apnea is a medical emergency and therefore requires prompt intervention such as surgery or use of oral appliances. However, if you have mild to moderate sleep apnea you are an excellent candidate for singing therapy. In terms of age, while very young children may not grasp what is required of them to do the singing exercises, this form of therapy is equally effective for them as it is for the adults. As mentioned previously, the quality of your voice is not important in singing therapy. Obviously, if you possess singing talent, you will find this quite interesting and enjoyable. One more thing that determines who can benefit from singing therapy is the individual him/herself. Since it can take up to 3 months and a degree of discipline to see results, if you’re impatient you may not benefit from this form of treatment! It is important that you dedicate about twenty minutes daily to singing for at least three months. If you are unable to stick to this, you might want to look into other forms of treatment. Interested in learning more about singing therapy for sleep apnea? Please click here to find out how you can cure your sleep apnea in the next 60 days with singing therapy.